Our zoo: The Parrot's Hilton and stuff. The Parrot's Hilton and stuff. I was trying to put some newspaper in the macaws barrels to provide a little warmth. It finally got cold here today, in the 30's and I was a little worried.I opened up the side door on Caicos and Sammy's(blue and gold macaws) barrel, and as fast as I could put the paper in they were hauling it out.So I tried Rockie and Little Bit's (yellow collard mini macaws)barrel and they were more afraid of the paper and left it be, so it's still in there.I thought I'd take a pic and show where 2 pair of our macaws reside. Alex and Taz(green winged macaws) are due to move out in the third section when they become bonded and unhandleable. 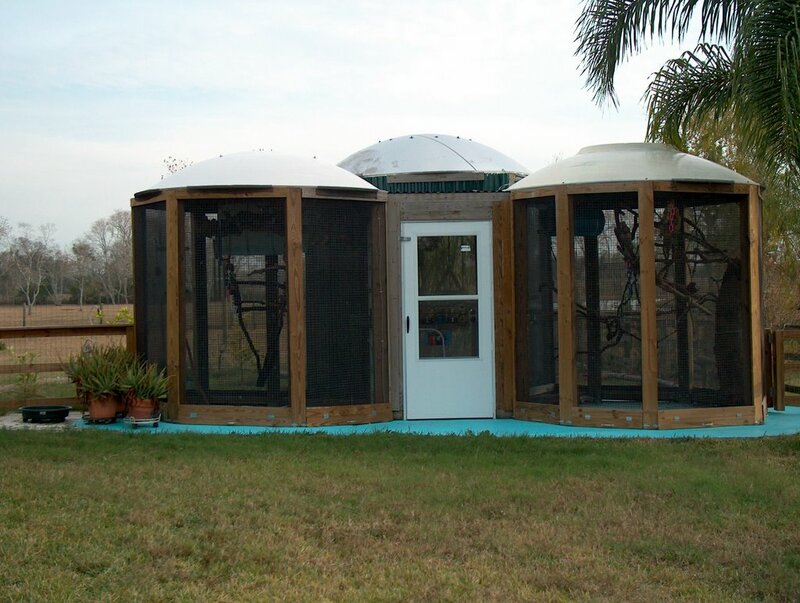 This is what we call "The Parrot's Hilton".I came up with this aviary idea and finally put it to use. The tops are old satellite dishes I found throughout our area. There are three "condos" and are 10 foot across and 9 foot tall. They have heavy guage wire on the inside and aluminum screen on the exterior(for mosquito control).The floors are concrete and painted so the bottom is easy to clean.I made louvered doors at the very bottom so I can wash the floor from one side to the other.When it gets real cold we can wrap the Hilton with tarps and put a heater in the hall(that's the section with the white door, I made it as a double door system so no one accidentily tries to fly out). We've also hung a bunch of grape vine and wood toys out there to stimulate them. Most breeders belief is not to do this becomes it distracts from breeding. These were pets first and foremost, and a big part of our lives. Susan and I want them to be content, stimulated and happy, so if they have babies fine, if not that's o.k. also. The blue and golds have had 2 babies and we kept the 1st one. His name is Junior and he is a trip. I'll profile him later. Anyolhoo, when I'm not doing animal stuff, I like to be like an animal in the excercise room , and this was achieved on the dreadmill. First it was the ab routine 7 different ones some using weight some not, doing 2 sets each at 15 reps or until fatigue, which I made it all today.It's all goooood! Then the dreadmill: I was like an animal possesed on that thing today and I didn't even want to do it, but I played a mind game and pretended if I could break 2 miles that someone would let me break out the hedgetrimmers, lol! Now I got to go find those suckers. Man,what a little hedgetrimming can do for a man! I did 2.02 miles in 20 minutes and burned 257 cals(a new personnal best).Yahoo! Snip snip, trim and cut! Oh well it got me there didn't it. By the way with them new potatoes, what do you think a portion consists of.They are about the size of a ping pong ball so the only thing I could think of is a portion would be how many I could put in my mouth at one time. 7 almost 8 but that 8th one was pushing the 1st one down my throat, lol.Anyway what do ya'll think would be a good portion. I love the Parrot's Hilton.. Great design and great use of discarded satellite dishes! Screw Disneyland, can I visit your zoo? LOL "dreadmill" Thats a good one! I am just in awe over your Farm/Zoo! Sounds like you program is going well!